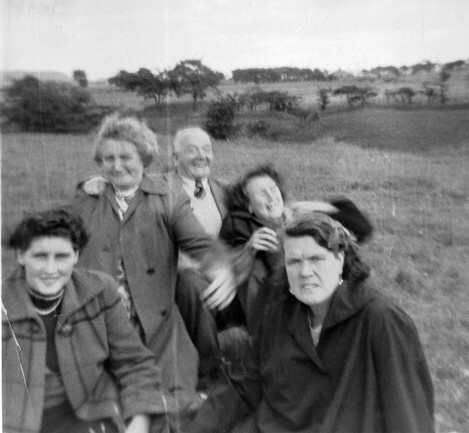 I think that is Mrs McDowell in the front right of this picture and maybe Winnie Rafferty behind her. Does anybody recognize them? Back row: Mrs Doyle, Pat Rafferty and Winnie Rafferty. Front: Nellie Gaffney and Mrs McDowell. I agree with you Anne, but I cannot place the other two ladies or the man. Someone help! Nice to see another name I recognise and remember very well, Margaret McFarlane, and of course I know all of the people in the photo. I was great friends with the two Rafferty girls and have fond memories of them. I lived across the road from Mrs McDowell for years, another nice family. Jenny McDowall was my mother's auntie- my gran was Winnie McDowall. I remember going to my auntie Jenny's when I was a child and having a great time. My mother was Elizabeth (Betty) Cone, sister of Pat Cone in Addiewell, and other siblings there. Her mother (I am told) is the woman in the front right. However, I am confused by the comments as to who the woman is behind her, perhaps a relative? Does anyone remember my mother in Addiewell?